The late 1830s were years of great ferment, progress, growth and change for the United States Mint. Steam-powered coinage made its debut in 1836. The first branch mint opened in New Orleans in 1838, and new designs were placed on all the gold and silver coins between 1837 and 1840. The technical and artistic advancements were interrelated, for it was the introduction of steam power that stimulated Mint officials to update the coinage aesthetically as well. On the silver coins, the new look took the form of a seated figure of Liberty with her right hand resting upon a shield and her left hand grasping a staff topped by a Liberty cap—symbols of preparedness and freedom. Thirteen stars are arrayed around her, and the date is below. This design first appeared on pattern and regular-issue silver dollars in 1836, and thereafter was adapted for use on all the remaining silver coins: the half dollar, quarter dollar, dime and half dime. This “Seated Liberty” design (interchangeably known as the “Liberty Seated” type) was fashioned by noted portraitist Thomas Sully and executed by Mint engraver Christian Gobrecht, a man of great technical skill. Its neoclassical appearance accurately reflected Americans’ artistic taste in the mid-19th century and, indeed, nearly to the threshold of the 20th century, for that’s how long it lingered on three of the coins before giving way to the Barber design in 1892. The half dollar was the last of the five coins to get this new design. Well into 1839, new fifty-cent pieces continued to bear the Capped Bust likeness of Liberty long viewed with affection by collectors. Since 1836, however, Capped Bust halves had lost a key part of their earlier distinctiveness and charm because they were being made on a steam press and with reeded edges, rather than the old-style lettered edges. The so-called “Gobrecht dollars” of 1836-39 wedded the Seated Liberty obverse to a breathtaking reverse featuring a majestic flying eagle. This was the work of another exceptional artist, Titian Peale, again with the die work by Gobrecht. Unaccountably, though, this magnificent design was scrapped when the art work was adapted for the smaller silver coins. Then, in 1840, it was dropped from the dollar as well. Mint officials chose instead to use essentially the same reverse on the half dollar and quarter as the one that had appeared on their Capped Bust counterparts. Again, the central device was a naturalistic eagle with a shield superimposed upon its breast. UNITED STATES OF AMERICA is inscribed above the eagle on each of these coins, and the statement of value appears below. On the fifty-cent piece, this takes the shorthand form HALF DOL. The Philadelphia Mint struck nearly two million Seated Liberty half dollars in 1839, the first year of issue, and these come in two major versions. Coins produced from the very first obverse die show a larger rock upon which Libery is seated and no trace of drapery at the crook of her elbow, while subsequent strikes all exhibit a fold of drapery there (unless they have undergone excessive wear). The No-Drapery pieces are scarce in every grade and flat-out rare in mint state levels of preservation. Seated Liberty halves remained in production for more than half a century, from 1839 through 1891, and mintages generally ranged between 500,000 and two million, with higher peaks and lower valleys. These coins saw widespread use, but people viewed them respectfully, for many Americans’ weekly pay was well below $10 in those days. The series’ unusual length makes it somewhat unwieldy to collect. Partly for that reason, hobbyists have divided it into several sub-categories. Perhaps the most important division is the one between “No Motto” and “With Motto” examples. The motto in question is IN GOD WE TRUST, which first gained a place on United States coinage during the Civil War. In 1866, the Mint added this inscription to the half dollar, placing it on a banner above the eagle. It remained there throughout the remaining quarter-century of the coin’s production. Two other major varieties loom large in the 27-year life-span of No-Motto “Seated halves.” Both were direct results of the California Gold Rush, which totally upset the delicate balance the Mint had been striving to maintain in the relative values of gold and silver in U.S. coinage. As huge amounts of gold poured out of California, the yellow metal’s value dropped in relation to silver: Soon, 200 half dollars melted into bullion would buy not $100 in gold but $106.60. This gold, in turn, could then be exchanged at face value for more silver coins. By 1853, silver coins were worth more as metal than as money, and melting was rampant. The Mint combated this imbalance in 1853 by reducing the amount of silver in its coins. With the half dollar, it trimmed the overall weight from 13.36 grams to 12.44. To call attention to this change, it placed arrowheads alongside the date and rays around the eagle. The arrows remained in place for three years, but the rays were removed in 1854. This created two significant varieties: the Arrows-and-Rays half dollars of 1853 and the arrows (without rays) pieces of 1854 and ‘55. The arrows were removed in 1856, but the lower weight continued. These varieties are popular type coins. No-Motto Seated Liberty halves were made at two branch mints, New Orleans and San Francisco. The “O” or “S” mintmark can be found below the eagle on these coins. Low-mintage No-Motto issues include 1842-O Small Date, 1846-O Tall Date, 1852, 1853-O No Arrows, 1855-S and 1866-S. A recent discovery is the unique 1842 Philadelphia Mint half with Small Date and Small Letters. The 1866 No-Motto Philadelphia piece is believed to be unique (as is its companion quarter). Proofs were made for public sale beginning in 1858, and small numbers exist for some of the earlier dates. Most dates of No-Motto Seated halves are relatively plentiful in grades up to Mint State-64. Above that level, however, their availability drops sharply. Points to check for wear include Liberty’s knee, breast and head, and the eagle’s head, neck and tops of wings. In 1853, shipping magnate Cornelius Vanderbilt acknowledged that he was worth 11 million dollars and reported that his fortune brought him an annual return of 25 percent. Less affluent Americans found themselves in the chips, as well: Potato chips were invented at Moon’s Lake House in Saratoga Springs, New York, when chef George Crum peevishly shaved potatoes paper-thin after a diner complained that his French fries were too thick. Although the Civil War was less than a decade away, many Americans were preoccupied with bread-and-butter issues, including their own net worth. Gold and silver played a big part in their calculations. As gold became more plentiful, its value declined in relation to that of silver; put another way, the value of silver increased in relation to that of gold. Either way, the result was the same: Silver coins all but vanished from circulation. It was really a matter of simple economics. Up to then, silver coins with a face value of $100—say, 200 half dollars—would have had enough bullion value to buy $100 in gold coins. Now, with the new relationship, that same $100 worth of silver was enough to buy more than $106.50 in gold coins. Bullion speculators melted silver coins to buy up gold coins, then used those gold coins to buy more silver coins, repeating the process over and over. By 1853, most U.S. silver coins were worth significantly more as metal than as money, and melting was rampant. Mint Director George N. Eckert came up with a plan. He called on Congress to lower the weights of most of the silver coins to the point where melting them wouldn’t be profitable any more. Congress balked at the prospect of debasing the coinage in this way, but most legislators had difficulty grasping the nuances of the issue. Legislative debate was intense, primarily against the idea of a fiduciary coinage, which was thought to be dishonest, but there seemed to be no other way out of the dilemma. Ultimately, the necessity to do something about the problem forced Congress to go along. The Coinage Act of February 21, 1853, considered a temporary measure until the value of silver stabilized, lowered the weight (and thus the silver content) of all the silver coins but the dollar and three-cent piece by approximately seven percent. (The three-cent piece was already a subsidiary coin and was not being melted). This had the effect of reducing the relative value of gold and silver in most United States coinage to slightly less than fifteen-to-one. It also had the effect of greatly diminishing the widespread melting of silver coins and, in the process, restoring them to the nation’s commerce. Curiously, retaining the old standard in the silver dollar would seem to be at odds with the intention of the legislation. As Congress was strongly divided on the entire question, it’s probable that the dollar remained as it was as a sign of the nation’s continued allegiance to bimetallism. Regardless of the intent of this symbolism, the country was, for the moment, effectively on a gold standard. Because of the emergency nature of this action, there hadn’t been time to prepare and obtain approval for new designs. Still, Mint officials understandably felt the need to make the new coins readily distinguishable from the older, heavier coins. Otherwise, they too, might be subject to melting. Weighing the coins would make the difference apparent, to be sure, but Mint officials wanted something even more immediately obvious. They hit upon the idea of placing arrowheads next to the date. At that time, there were six silver coins, and five of them (all but the three-cent piece) had a common obverse that featured a portrait of a seated female figure representing Liberty. This Seated Liberty design had been fashioned by portraitist Thomas Sully and executed by Mint engraver Christian Gobrecht. It first appeared on the half dollar in 1839, replacing the Capped Bust design. 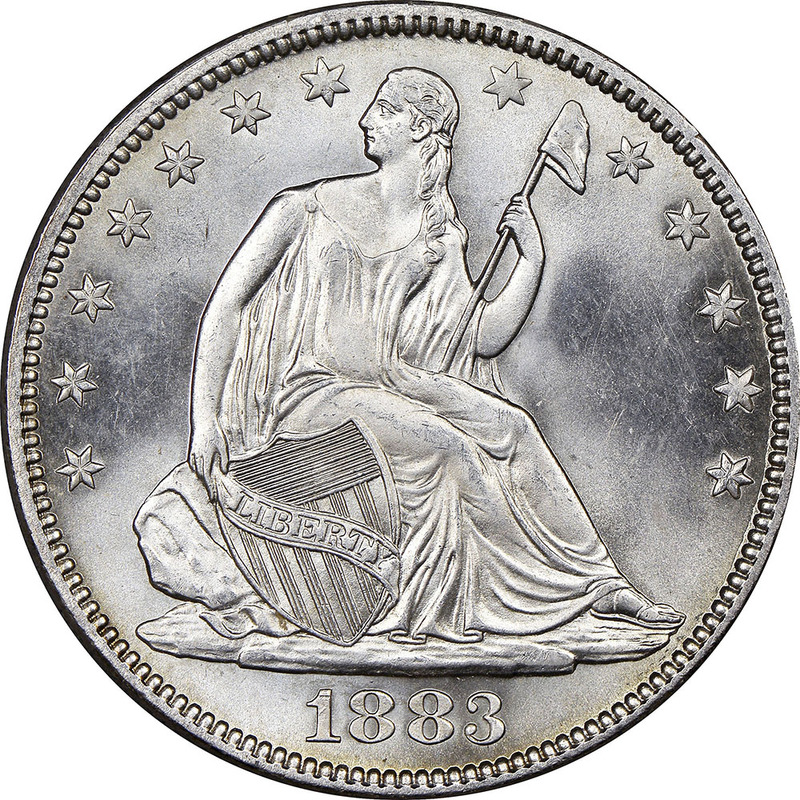 Four of these Seated Liberty coins—the half dime, dime, quarter and half dollar—had their silver content reduced in accordance with the new legislation, partway through production in 1853. From then through the end of 1855, all bore arrowheads beside their dates. Seated Liberty half dollars with arrows and rays were struck at two mints, Philadelphia and New Orleans (with the “O” mint mark below the eagle), and both had relatively high mintages. Being perceived as common, though, they weren’t widely saved in mint condition, and high-grade pieces are surprisingly scarce. Points to check for wear include Liberty’s head, breast and knees and the eagle’s head and wing tops. Virtually overnight, the nation’s supply of half dimes, dimes, quarters and half dollars vanished from circulation. Bullion brokers, speculators and ordinary citizens plunged into frantic hoarding, followed by the export and melting of vast quantities of silver coins. Nothing was left but the tiny “fish scales,” silver three-cent pieces struck in a debased .750 fine alloy and therefore virtually “meltproof,” even at advanced silver prices. U.S. Mint Director George N. Eckert came up with an immediate and easily implemented solution. He obtained authorization from a sympathetic Congress to reduce the weight of the half dime, dime, quarter and half dollar, while keeping the existing fineness, sizes and designs. The Act of February 21, 1853 directed that the new coins would have the same color and wearing properties as the older issues, and the weight reduction would be relatively minor. The half dollar would go from 206.25 grains (13.36 grams) to 192 grains (12.44 grams). Half dollars minted before 1853 were of the Christian Gobrecht designed Seated Liberty type. They had been in production for over a decade, and the public was quite used to seeing Liberty seated on a rock and an eagle with outstretched wings. Eckert felt a need to provide some visible symbols by which the new coins could be distinguished. After all, if silver prices fell and the old standard was resumed, the lighter weight coins might be withdrawn. If the lighter standard became permanent, older coins without the distinctive mark might be easily culled out by banks, Treasury offices and other coin handling centers. The first lighter weight coins released in 1853 featured arrowheads flanking the date on the obverse and a glory of rays surrounds the eagle on the reverse. This combination was highly visible, but the rays complicated the die makers’ work and slowed die production to an unacceptable degree. Dies with the rays also failed much more quickly that the older design, requiring endless preparation of more replacements. A small but unrecorded number of proofs of both years exist. Perhaps as many as 20 pieces survive of the 1854 coinage, while proofs of 1855 are rarer still, with about a dozen pieces known today. The late Walter Breen recorded three “Branch Mint Proofs” of the 1855-S half, which he believed were struck to celebrate the beginning of silver coinage in San Francisco. One of these, given by San Francisco Mint Superintendent Robert Birdsall to Mint Director James Ross Snowden, later became part of the National Collection at the Smithsonian. The entire question of branch mint proofs is still an area of spirited debate, even among veteran collectors and students of America’s 19th century proof coinage. Close study of this short series reveals a host of minor varieties. Collecting this design by variety has few adherents, however, in spite of research available since the 1930s. M.L. Beistle first attempted a listing in his 1929 Register of Half Dollars Die Varieties and Sub-Varieties. More recently, his work was supplanted by Walter Breen’s Complete Encyclopedia and the Randy Wiley-Bill Bugert Complete Guide to Liberty Seated Half Dollars. Today, after many years of neglect, collectors are rediscovering the Seated Liberty coinage, partly through the efforts of the Liberty Seated Collectors Club and its publication, The Gobrecht Journal. Although high-end, mint state Arrows coins exist in large enough quantities to satisfy collector demand, the same cannot be said for proofs. Unfortunately, 19th century collectors did not regard these coins with the same respect shown by their successors, and handling marks and hairlines are the rule rather than the exception for proofs of this type. When grading this design, or any Seated Liberty half, wear will first show on Liberty’s head, breast and knees. On the reverse, check the eagle’s head, neck and wing-tops. Slightly less than 12.8 million Arrows halves were made in the two years, and they served their purpose well, remaining in circulation long after falling silver prices allowed discontinuation of the identifying arrows. They were in daily use throughout the 19th century and could still be found in the rural South as late as the 1940s. The coins were a major annoyance to dealers active in the early 1900s, thanks to the kind of inaccurate stories in popular newspapers that have always been a plague to informed numismatists. Cantankerous New York dealer Thomas L. Elder went as far as specifying the Arrows silver in a list of coins he would not buy in his ads in the city’s newspapers. Elder stressed that “nickels without CENTS on the reverse, and silver coins with Arrows at the date command no premium whatsoever,” and forcefully suggested that their proud owners spend them at face value! The year after the close of the Civil War should have been a joyous, forward-looking time, but in 1866 a million young men lay dead, buried in shallow graves in places with now-familiar names such as Shiloh, Gettysburg and Antietam. The carnage had focused the nation’s attention on the most important matters in life: survival, family and God. Survival had been uppermost in people’s minds during the War, even in the North, where hundreds of people were killed in anti-draft riots. Family was on their minds as they looked into the eyes of veterans and remembered those who would never return. And God was called upon by those who survived, to give meaning to the million left on the battlefields and the sacrifices the entire nation had endured. The Act of March 3, 1865 mandated the addition of the motto IN GOD WE TRUST to all silver coins above the dime and all gold coins above the three-dollar denomination. Christian Gobrecht’s Seated Liberty design, in use on the half dollar since 1839, depicted Liberty seated on a rock and surrounded by thirteen stars, with a reverse featuring a spread-winged eagle. 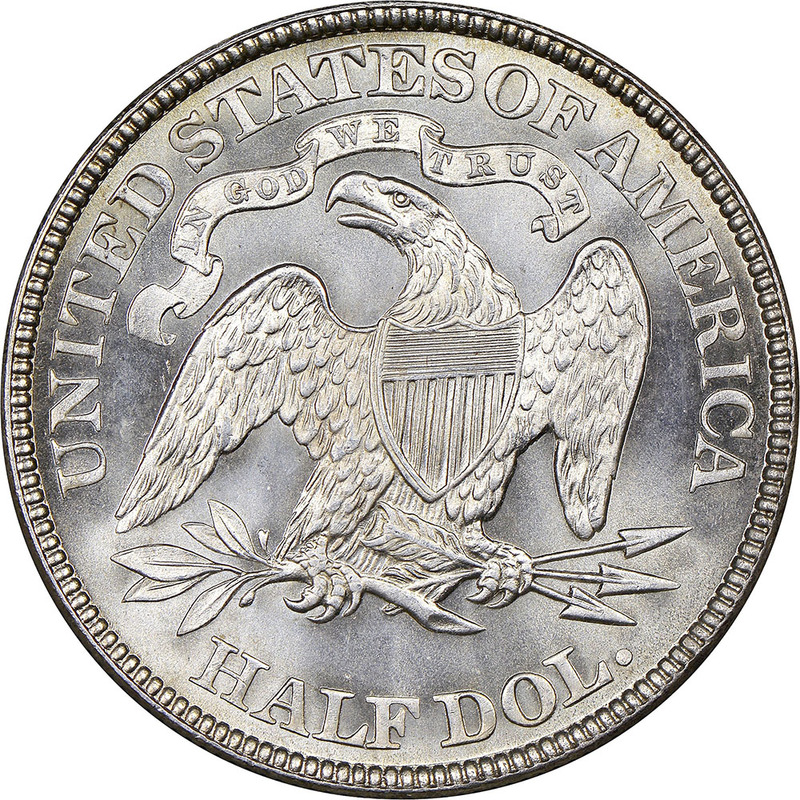 In 1866, a new master hub for the half dollar reverse was prepared with the motto on a billowing scroll above the eagle’s head. This change was the most significant design alteration to occur during the 53 years of Seated Liberty half dollar production. The only other design modification during this “With Motto” era was the placement of arrows by the date in 1873 to signify conversion to the metric system and a slight gain in weight. All currency strikes from 1866 to 1873 are scarce to rare, particularly in mint state. Specie payments had been suspended since late in 1861, and silver coins continued to be either hoarded or shipped overseas. Although the early Carson City coins (1870-73) were minted in small numbers and, as expected, are very rare today, both Philadelphia and San Francisco struck relatively large quantities prior to 1873. All suffered extensive melting after the change in weight. The most notable rarity of this group is 1873-S without arrows, which is unknown in any condition, despite Mint records showing a mintage of 5,000 pieces. Other major rarities from this period include 1870-CC (nearly unknown in mint state) and the 1873 Open 3 No Arrows, another issue that apparently was almost totally melted and is extremely rare in all grades. From 1879 on, only the Philadelphia Mint coined halves. Although the mintages were minuscule, this was obviously noticed by those with “coin savvy,” as many uncirculated pieces exist today. Several hundred proofs were struck each year from 1866 through the end of the series in 1891; many have a “cameo” finish, exhibiting a white mint frost on the devices contrasted against the mirrored “blackness” in the fields. Such coins can be quite beautiful and are highly prized by collectors, especially those assembling a proof type set. Generally, With Motto Seated halves are collected today as type pieces; however, the series is still collected by date and mintmark in circulated grades. Considering the rarities, completing a set can be a daunting task. Of special interest to pattern collectors are the so-called “transitional” proofs. Although dated 1863, 1864 and 1865, these coins have the reverse motto as adopted in 1866. It is now believed that most of these, along with the unique “fantasy piece” 1866 No Motto half, were struck around 1868 under the direction of Mint Director Henry Linderman for the famous pattern collector and Mint “insider,” Philadelphia pharmacist Robert Coulton Davis. When grading Seated halves, check the highest portions of the design for wear (i.e., the knees, head, neckline and upper shield). On the reverse, the eagle’s right talon, head, neck feathers and the right side of the shield will show friction first. Partly because of this pivotal law, 1873 saw the United States Mint issue 54 basic varieties of coins in 17 different denominations, the most diverse output of any single year in the nation’s history. Among these were coins from three different mints, coins with an “open” 3 in the date and others with a “closed” 3, and silver coins, including half dollars, with and without arrows beside the date. Far from being criminal in the eyes of collectors, this outpouring of varieties has long been viewed as both a bonanza and a challenge. Some collectors, notably the late Harry X. Boosel of Chicago, have made the coinage of 1873 the focal point of their numismatic pursuits. Almost all are intrigued by the size and scope of this one-year set, one which makes its modern counterparts seem puny by comparison. Actually, hardly anyone looked upon the Mint Act of 1873 as a “crime” at the time it was passed. That term didn’t arise until several years later, when silver-mining interests and their powerful friends in Washington, disgruntled by a decline in silver coins’ production levels, reassessed the law with 20/20 hindsight and blamed it for all their troubles, mainly because it had abolished silver dollars. By the late 1860s, the United States coinage system was a crazy quilt of denominations and types. The Mint was producing two different kinds of three-cent pieces, two different five-cent coins and two kinds of dollars (one in silver, one in gold). Some coins had clearly become redundant. This conclusion, plus other observed inefficiencies, led to the appointment of John Jay Knox to oversee a review of the mints and the coinage system. Knox, a man of unquestioned integrity, soon concluded that the basic monetary law of 1837, as amended piecemeal in the 1850s and ‘60s, was no longer adequate to serve the nation’s needs. He urged that U.S. coinage laws be streamlined and strengthened, and he drafted a proposal for accomplishing this. In dropping silver dollars from the Mint’s production lineup, the Coinage Act of 1873 seemed to be simply acknowledging that the large, bulky coins were seeing little use in the nation’s commerce. Initially, the silver interests didn’t put up much resistance, because the law provided an alternate outlet for their bullion with the newly authorized Trade dollar. As the decade wore on, however, it grew painfully apparent that the Trade dollar wouldn’t succeed in its designated role as a bullion coin in the Far East. To complicate matters further, huge supplies of earlier U.S. silver coins, hoarded during the war, returned to circulation from their hiding places abroad, forcing the Mint to curtail production of new ones. This drastic reduction in coinage coincided with a dramatic increase in silver-mining activity, notably at Nevada’s Comstock Lode. This squeezing the silver interests and causing them to scream, belatedly but loudly, that a “crime” had been committed at their expense. That, in turn, led to a resumption of standard silver dollar coinage in 1878. Because of the 1873 legislation, the half dollar briefly became the largest U.S. silver coin issued for circulation (the Trade dollar being intended exclusively for use overseas). It was no mere pretender to this throne, for fifty cents represented a substantial sum of money in that era: Seven out of ten industrial workers earned no more than ten cents an hour at the time. For more than three decades the half dollar had carried the Seated Liberty design, a motif it shared with the silver dollar, quarter dollar, dime and half dime. This design was fashioned by well-known portraitist Thomas Sully and executed by Mint engraver Christian Gobrecht. It first appeared on the half dollar in 1839, replacing the Capped Bust design. The familiar Seated Liberty image remained there through 1891, giving way the following year to Charles Barber’s Liberty Head design. As part of the coinage overhaul undertaken in 1873, the weights of the half dollar, quarter and dime were increased slightly to simplify their legal weight as measured in grams. This was part of Congress’ modest attempt to introduce the metric system into the nation’s coinage, following the standard used by European countries. In the case of the half dollar, the weight was boosted from 12.44 grams to 12.50. Undoubtedly, this made metric calculations somewhat easier, but its impact was negligible. It did bring about a minuscule increase in the amount of silver used in U.S. coins, though obviously not enough to satisfy the miners and their friends. By the time the legislation took effect, the Mint had already produced significant numbers of 1873 silver coins at the old weight levels. It needed a way to readily identify the new coins, since it would be furnishing these at a slightly different exchange rate to depositors who brought in silver bullion. Officials decided to place distinctive arrowheads alongside the date on the new, slightly heavier coins. The Mint had used the same device in 1853 to denote a slight reduction in weight. This time, the arrows appeared for only two years and were dropped at the start of 1875. Slightly over five million halves of this design were struck in 1873 and 1874 at the mints in Philadelphia (no mintmark), San Francisco (S) and Carson City (CC). Mintmarks appear on the reverse below the eagle. Proofs were made in both years: 550 in 1873 and 700 in 1874. Both Carson City issues are quite rare in all grades and especially so in mint-state, while the San Francisco coins are a little less so. Type collectors most often find the Philadelphia issues in high grade. When grading this design, wear will first show on Liberty’s head, breast and knees and on the eagle’s head, neck and wing-tops.